(Bibliographic info and brief plot summary here). Aurora may be my favorite Kim Stanley Robinson novel yet. Given how much I’ve loved his previous work, especially the Mars Trilogy and 2312, this is saying quite a bit. And the ship itself may be one of my favorite SF characters of all time. Last year I attended an event at the Tucson Festival of Books in which Kim Stanley Robinson (KSR) explained his next project, the novel that became Aurora. He explained his thoughts about the physical futility and human arrogance of the very idea of interstellar colonization. He said people would find the novel too pessimistic. People would hate it. KSR’s prediction turned out to be right for some reviewers (see this one by Gregory Benford and this one from Giulio Prisco). Others have had more mixed feelings (see this one from a fellow philosophy and science fiction blog, Xeno Swarm, as well as this follow up). And some, like myself, have praised it (see this one on From Couch to Moon and this one on Val’s Random Comments). I don’t find the novel to be pessimistic. I do find it melancholy. And beautiful. And intensely thought provoking. And heart wrenching. And poignant. And deeply satisfying. The primary emotional mode of the novel is melancholy. Unlike pessimism, which I would define as sadness about things not turning out as they should, melancholy is a resignation about how things have turned out and a questioning of why anyone ever thought things should be otherwise. Schopenhauer is pessimistic; Ecclesiastes is melancholy. Dystopian science fiction is born from and feeds into our pessimism, which I suspect explains its popularity today. A lot of science fiction tends toward unmixed optimism about the promise of technology and future social evolution (Star Trek is the most salient example, but this is generally pervasive in space opera and hard SF). 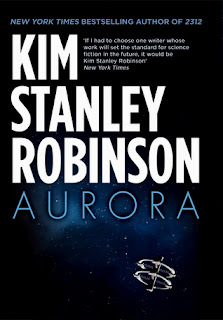 But in Aurora, KSR has achieved something neither unremittingly dystopian nor unapologetically optimistic; it’s something in between, something you might glimpse in the work of other melancholy optimists like Arthur C. Clarke, Iain M. Banks, or Ursula K. Le Guin. “Yes, a busy place, the interstellar medium. Empty space, near vacuum; and yet still, not vacuum itself, not pure vacuum. There are forces and atoms, fields, and the ever-foaming quantum surf, in which entangled quarklike particles appear and disappear, passing in and out of the ten suspected dimensions. A complex manifold of overlapping universes, almost none of them sensed by us … Flying through ghosts. Passing through a mystery. It is as if the skin of the ship (or its brain, in that usual confusion between sense and thought) experiences a slight itch, or a faint breeze” (p. 328). “We are all alone in our own life-world, flying through the universe at great speed. Humans are lucky not to face that. If they don’t” (p. 338). “Flying through the stars. … A nova off the port bow. Blue shift ahead, red shift behind. The stars” (p. 342). I personally tend toward melancholy rather than pessimism (even my favorite humor is melancholy: see my post on subtle humor). Maybe this is why I found Aurora’s melancholy to be a cool, comforting draught, a deep gulp of peaceful resignation. The universe is what it is. We’re just visiting. KSR is one of the most philosophical science fiction authors working today, so it’s no surprise there’s a lot I could include in my philosophy report: the technological sublime, environmental philosophy, obligations to future generations, epistemology, philosophy of science, political philosophy, consciousness, artificial intelligence, logic, and more. Gödel’s Incompleteness Theorems and the Turing Test make appearances (the nerd sublime!). No single review could do justice to KSR’s treatments of all of these issues, so let me concentrate on a few topics. KSR is often accused of info dumping as if his narrator were a quasi-omniscient computer program with a penchant for providing extensive and unnecessary details. I feel like ship was his response to this criticism: “You say I narrate like a computer, well, take this!” But the character known simply as "ship" is much more than KSR's response to info dumping charges. It becomes a fascinating character in its own right that might teach us something about artificial intelligence and narrative identity. By holding up a well-polished literary mirror, ship teaches us more about humanity than any of the human characters. In this role, ship is something like Spock or Data on Star Trek, but more mysterious, even more endearing, especially in ship’s attempts to master natural language. “So: ‘We’ll see.’ ‘We’ll find out when we find out.’ Among other vernacular expressions of helpless stoicism in the face of future uncertainties. Not hugely satisfying. Stoic indeed” (p. 335). Ship consists of the quantum computer AIs that run the ship. It is strongly hinted that ship goes from highly developed weak AIs to possible strong AIs through the process of constructing a narrative at the behest quoted at the beginning of this review. This in turn lends support to narrative theories of identity (at least narrative support!). Ship explicitly discusses on a few occasions that it (or really, “they” since ship consists of many AIs and uses plural pronouns for itself) is a narrative: “We tell their story, and thereby come to what consciousness we have. Scribble ergo sum” (p. 351). There are Buddhist undertones in one of ship’s suggestions that ship itself/themselves really is nothing but a collection of disparate processes united simply by an identity constructed through narrative. Are we any different? In philosophy of mind, the hard problem is the problem of how physical brain states create the phenomenon of first person consciousness. Aurora discusses this hard problem, but also at least two others: how to slow down when you’re traveling at one-tenth the speed of light and how to find meaning. Ship, a consummate philosopher, realizes that one of these problems has an extremely difficult yet findable solution, while the others prove far more elusive. Amid the proliferating ideas, there is a central message of the book, which is obvious both from the novel itself and from KSR’s comments in interviews (see this one from NPR's Science Friday). This message becomes more obvious in the last part of the novel, which, while necessary for the book’s structure, was my least favorite part (it would be an unforgivable spoiler to explain my main reason, but I can say that it was a longer denouement than the narrative probably required). Getting at his message, I imagine KSR asking: Who the hell do we think we are? Why must we spread ourselves into the galaxy beyond the solar system? Is this feasible biologically, ecologically, politically, psychologically? Is the very idea of interstellar colonization a type of transcendence that ultimately represents our species-level arrogance? Is Earth a cradle we can leave or it is rather our proper home that must be protected if we are to survive? KSR’s typical ecological imagination and environmentalist principles should be apparent. The central message of Aurora is this: like it or not, we are essentially Earthlings. There’s something melancholy about this, but also something joyful. We are limited, but we are also grounded. We become who we are through narratives; we are narratives. This realization can be frightening, but it's not so bad when those narratives can be as beautiful, as thoughtful, as challenging, and as enjoyable as Aurora. (See also my Goodreads review). It is certainly a book that provokes discussion. I'm a bit surprised at how polarized opinions of the novel are to be honest. Many of the dangers he discusses in the novel have shown up in other science fiction novels over the years. It is a bit surprising. I wonder if the difference is that most other science fiction deals with these dangers as problems to be overcome while KSR sees them as arguments against the very idea of interstellar travel. Given how many people signed up for that one way ticket to Mars I don't think anything Robinson put into the novel will stop any potential colonists. If anything it will challenge people to try and disprove him. Which unfortunately distracts a bit from another of the points Robinson is trying to make; that we should take better care of the Earth. I lied, I read your review anyway. Thank you for avoiding spoilers. I was really surprised when I saw his next novel was about interstellar travel, since I've heard him quoted more than once (and he even said, straight out, in 2312) that interstellar travel is essentially impossible and/or fruitless. I love the fact that he wrote a novel exploring it while not relinquishing his position on it. Can't wait to read it. Thanks for the review. No problem! I try to give spoiler alerts, but I found it unnecessary this time. It says something about KSR's brilliance that he could write a space opera about how space opera is a dangerous delusion. Let me know what you think about the novel! So, another book on my reading list! I love weird ships; and to date my favourite SF image is the Mercurian city,Terminator. The idea of putting it on gigantic tracks to avoid the sun in 2312 is brilliance. That was one of many brilliant parts of 2312! Auora's plot is much simpler and the mood more melancholy, but I think if you liked 2312, you'll like Aurora, too. "There is something melancholy about this, but also something joyful..."
I completely agree. Robinson is being the realist, defining our limits, but giving us something to celebrate with those hard truths. We are Earthlings! Earth is not disposable! Which might explain that drawn out denouement: Freya suffering hardships, the near drownings, but she keeps going back in the water. I read it as a testament to the power of nature-- something we just have to live with, even though it will knock us down, over and over (and over and over) again. Glad to be in the "Love Aurora" Club with you! Thanks! It's an exclusive club! I really loved the relationship between Devi and Freya, too, which I didn't get to in the review. I saw why the last section was necessary. That's a good point about going back in the water. Also, instead of sailing on top of the water, she's immersed in it, which itself might say something. I loved the whole book so much and didn't mind reading the last section, but I felt like it went on just a little too long. I generally agree with your reviews, and thank you for discussing "Ship," as she prefers to be called. The almost all-powerful benevolent and philosophical narrator was by far the most interesting character and my favorite of the bunch. My greatest complaint, apart from the rather facile plot devices that forced major decision points on Aurora (avoiding spoilers here), was that Ship's final disposition was not given more attention. I wanted to know more about what happened. I wanted to wallow in the emotion of what happens to this character that become a force to be reckoned with. I half expected Ship to become dangerous to anyone who threatened her people (her children), but the author sorry t of dropped the ball on this fascinating creation. Didn't this newly formed consciousness take steps to share what it learned? It's not even clear if the narrative Ship created was shared with the world before Ship moved on. Do you think that's an oversight or just the way it is? Thanks for an excellent comment! Ship is definitely one of my favorite characters ever. I suspect that KSR (the author) didn't want ship to become dangerous to people, maybe for fear of falling into the "AI is going to kill us" trope, but I'm not sure. I suppose ship must've shared the narrative (how else were we reading it?). Ship's final fate is one of the most poignant things I've ever read. I think it was required for the narrative. Aurora will be #1 on my 2015 favorite books list (coming soon! ).